Although APS is still a relatively small brand in the grand scheme of things, their product line is constantly growing and the company are constantly gaining traction. Perhaps their most famous supplement is Mesomorph, which has long been considered one of the better pre workouts around. Unfortunately, recent developments have meant Mesomorph 2.0, their most recent version of the pre workout will slowly be removed from shelves in favour of their brand new supplement and pre workout; APS Morph 3. Synthenox-Carnosine/Nitric Oxide Complex – Beta alanine, l-citrulline, arginine and 2-oxo-pentanedioic acid. Mesoswell-Cell Volumising ATP Matrix – Creatine malate, l-taurine, creatine nitrate, ascorbic acid, creatinol-o-phosphate and agmatine sulphate. Neuromorph-Neuro Energised Stimulant Matrix – Glucuronolactone, caffeine anhydrous, grapefruit extract, Eria Jarensis extract, Erythropalum Scandens extract and citrus aurantium extract. As we've come to expect with your average pre workout, Morph 3 does not disclose the levels of all ingredients; with the exception of caffeine, taurine and glucuronolactone, which are present at 300mg, 1500mg, and 1200mg respectively. So with a full serve, users are guaranteed a hefty dose of caffeine, which will naturally mean caffeine-sensitive individuals will have to half the dose to get a more manageable dose of caffeine. Congnisant of the high dose of caffeine, APS have taken the unusual step of providing the equivalent caffeine content in 100ml, when a 15.5g serve (1 level scoop) is mixed with 940ml of water, as directed. As seen on the nutritional information panel opposite, drinking just 100ml, will give users just 32mg of caffeine. But from a practical standpoint, its hard to imagine users mixing up a full serve in 940ml of water and then aliquoting off 100ml. But good on APS for providing the breakdown in any case. The scoop size is still relatively large at 15.5g, but APS have sure packed in a huge list of ingredients. The original two Mesomorph pre workouts were used for their pump and energising properties and the new Morph 3 is no different. If you’re after a supplement that will drive blood to the working muscle, giving you that massive pump, but also supporting energy and focus, then Morph 3 is definitely the supplement to go for. One of newer ingredients in Morph 3 being touted as a possible replcement to the infamous DMAA is Eria Jarensis Extract. There's next to no research on this extract, which makes it hard to speculate on its effectiveness. 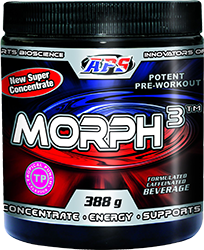 Morph 3 from APS is available in four flavours, namely, Tropical Punch, Frozen Margarita, Strawberry Kiwi, and Watermelon. Mesomorph 2.0 wasn’t a bad tasting pre workout. It mixed well, but was slightly sweeter than desired, so it’s probably best to mix with plenty of water. Although, we wouldn’t recommend mixing in the litre of water suggested by the supplement, unless you’re planning to sip it throughout the workout. All considered, Morph 3 is a good revision of the previous Mesomorph 2.0 that came under scrutiny with its disguised DMAA content in the form of acacia rigidula. With 300mg of caffeine per serve its certainly not for the faint-hearted. But with many of the hallmark pre workout ingredients featured plus a mix of the popular forms of creatine, it should appeal to a relatively wide range of the market. Certainly worth a try if you like your pre workout to have a bit of kick.